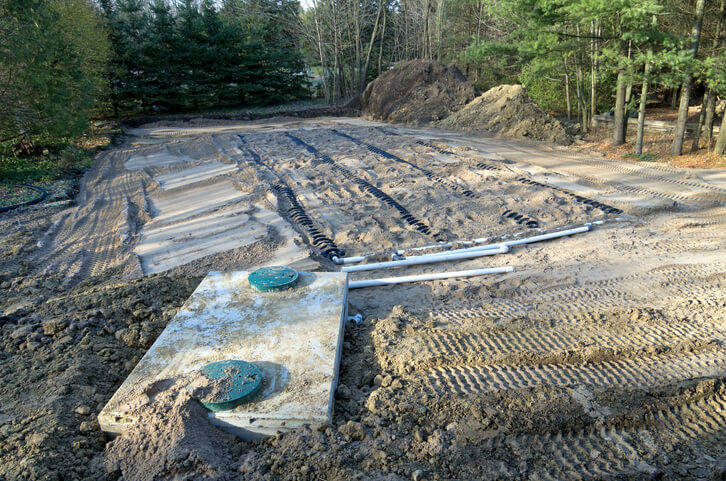 To fulfill its intended purpose, a septic system needs all components and parts to work together, including the drain field. A drain field, also called a leach field, acts as a natural underground filter for effluent leaving the septic tank. Organic material in the effluent is broken down by microbes in the soil as it slowly filters in. Because a drain field is a critical part of the septic system, Jones Plumbing & Septic Tank Service provides full-service Gainesville septic tank repairs to all types of drain fields. Call us today to schedule a septic system inspection. In a gravity drain field, effluent flows into a series of parallel, perforated pipes located in gravel-filled beds or trenches. The effluent then percolates into the gravel before entering the soil. A gravity drain field is the most common type of drain field installed and repaired by Jones Plumbing & Septic Tank Service and other septic tank companies in Gainesville, FL. This type of drain field uses septic, or lift, pump to move effluent from the septic tank to the drain field. Most homes and businesses with either gravitational or geographic discrepancies between the tank and drain field have a pressure distribution drain field. Holding tanks are rare but are made from a non-permeable material meant to temporarily hold the effluent. This style of drain field needs frequent septic tank cleanouts to avoid septic system problems such as sewage backups. Generally found in older businesses and homes, cesspools allow the effluent to trickle out of the holding chamber into the surrounding soil. This method is considered significantly less efficient than a drain field. A mound system is generally used in septic systems with high water tables or porous bedrock. An artificial drain field is built above ground inside a man-made mound of soil. This is to allow an adequate amount of space for the effluent to filter. A supplement to a drain field, an ATU creates an environment favorable for aerobic bacteria growth. This aerobic bacteria is able to break down solids inside the septic tank more quickly than naturally occurring anaerobic bacteria. Also called a seepage pit, a dry well relies on another crushed rock layer to increase absorption around the holding chamber. The drain field supports the health of the surrounding environment and soil. Since its purpose is to filter the effluent, an inefficient or ineffective drain field allows harmful bacteria, chemicals, and other contaminants to seep into the groundwater and soil. This can affect the water quality of wells used by homes and businesses, along with natural bodies of water. A range of health issues can develop for any person or animal who ingests the contaminated water. The best way to avoid this issue is by scheduling annual septic system inspections with Jones Plumbing & Septic Tank Service. Our technicians inspect all parts of the system, including the drain field. We’ll always let you know if an issue is isolated to the drain field or another part of the system, and what repairs, such as a septic tank replacement, is necessary. If you notice any of these signs, call Jones Plumbing & Septic Tank Service for emergency septic service. The average drain field will last 20 years with regular maintenance and repairs. If you believe your drain field is entering its twilight years, give us a call at Jones Plumbing & Septic Tank Service. Our technicians can inspect the drain field and if necessary, begin helping you decide on a new, replacement drain field. For high-quality septic tank service Gainesville, FL, home and business owners can count on, call Jones Plumbing & Septic Tank Service today!